Making My 4th Doctor Costume: Original 4th Doctor items - on eBay! Original 4th Doctor items - on eBay! Here’s what’s been on offer for Fourth Doctor fans. This prop may well have been used as a ‘stunt’ mask in the classic 1977 Doctor Who story Robots of Death but I have been able to confirm this. I believe it was made to be blown up during the course of the story but, whatever its origins, it is a magnificent display piece in excellent condition. 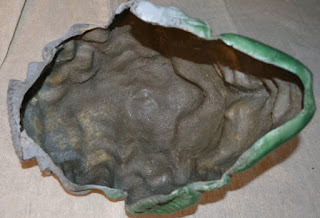 It is made from thick fibreglass and has been primed then sprayed green, although this hasn’t been finished off and the back section remains grey. This is a Knight’s Helmet from the classic 1978 Doctor Who story, Androids of Tara. It was later brought out of mothballs and utilised in the 1989 Sylvester McCoy tale Battlefield. This is two props for the price of one folks! 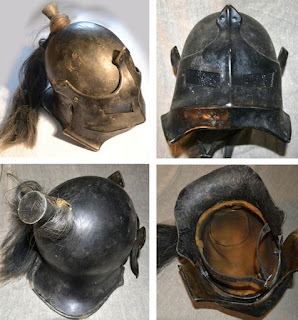 It’s made of fibreglass with a leather chin strap, bolted visor and horsehair detail. It has aged remarkably well, with no scuffs or scratches except some faint track marks where the visor has been lifted up and down. Don’t miss this chance to own an authentic piece of Doctor Who history! 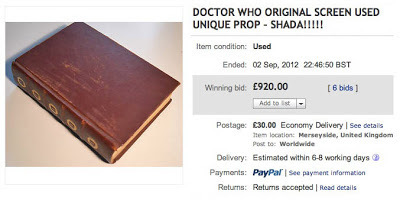 This is an original prop from the legendary uncompleted Doctor Who adventure, Shada from 1979. It is the infamous Ancient and Worshipful Law of Gallifrey, the book around which the entire story revolves. This really is a unique piece of Doctor Who folklore – not only is in pivotal to the story, it is from a story which has achieved cult status owing to it never being finished! The prop is a perfect bound leather book filled with cartridge paper pages. Most are blank but a section at the front and a dozen or so in the centre contain Gallifreyan text. This gives the illusion that every page is written on when the book is flicked through on camera. In response to several people asking about the authenticity of this item, I acquired it from the private collection of Ian Levine, Doctor Who Programme Consultant in the 80s and 90s, who acquired it from the Production Office. 3rd Doctor Costumes on eBay! 5th Doctor Costumes on eBay! 6th Doctor Costumes on eBay! 7th Doctor Costumes on eBay!